Recently, a number of new filling materials that mimic tooth color have come into popular use and, so far, have proven more durable than past versions. Even so, the traditional metal-based dental amalgam remains a viable choice, especially for less visible back teeth and their higher biting forces. Used for more than a century, dental amalgam is a metal alloy composed of silver, mercury, tin and copper. The mixture is carefully proportioned so that potentially hazardous mercury is kept to a minimum and bonded with the other metals. 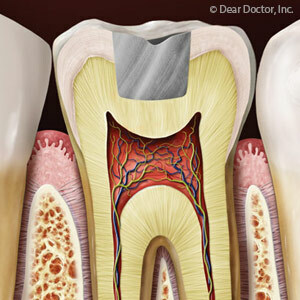 Amalgam in its initial form is quite pliable so that it can be molded into the tooth structure under repair. Afterward it sets hard to form a durable filling that can withstand the daily force generated when we bite and chew food. Besides durability, dental amalgam rarely causes an allergic reaction in a patient, and it’s easy for trained dentists to apply. On the downside, however, it can cause temporary temperature sensitivity in the tooth just after filling, and the tooth itself may require some removal of healthy structure to help keep the filling in place. And from an aesthetic point of view, its metallic appearance is considered unattractive especially for front teeth. The presence of mercury in amalgam has also raised concerns over the years. “Free” mercury — atoms that escape through vapor emitted by the metal — can enter the bloodstream and potentially harm the nervous system. But after extensive study and research, U.S. and international health bodies including the American Dental Association have concluded any free mercury released during chewing is extremely low and well below any harmful levels. These studies have also found no ill effects in either children or adults with dental amalgam fillings. Deciding on the type of filling material to use — dental amalgam or a newer composite resin, resin ionomer or glass ionomer — depends on a number of factors including the location of the teeth to be filled, the extent of decay and your personal preferences. Taking these into account, we’ll be happy to discuss which type of filling will suit you best for repairing decayed teeth.